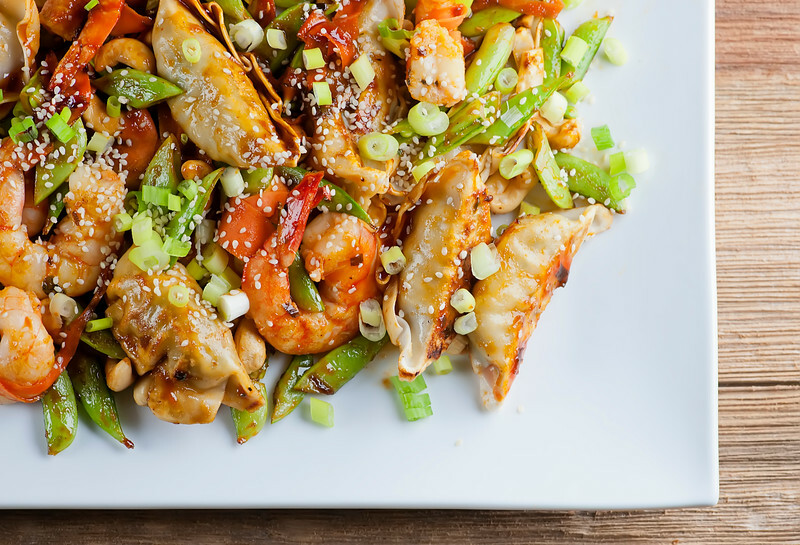 This easy shrimp dumpling stir-fry recipe was born out of my love and devotion to a certain chili sauce (more on that in a bit), but it also combines two of my very favorite things – shrimp and vegetable dumplings – with a whole lot of veggies and very little time. You can also customize it to your hearts content in terms of the ingredients, depending on what type of stir-fry you are in the mood for. 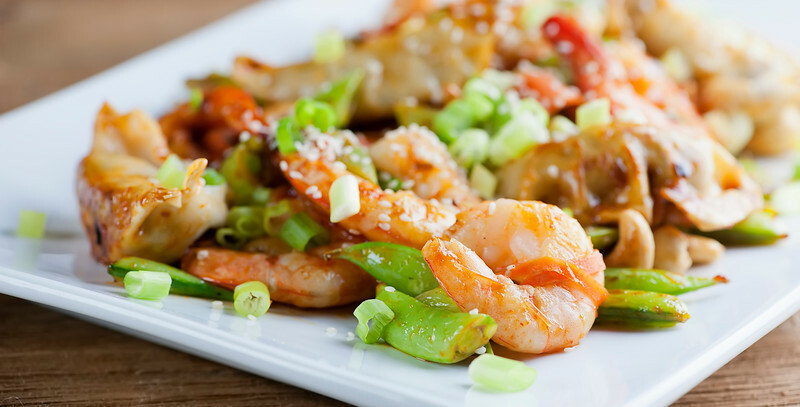 Quick, flexible, good and good for you – what more could you ask for in a stir-fry recipe? Let’s make it!First of all, that chili sauce. You want a sweet chili sauce for this recipe, and you can find these in the international section of your supermarket, or if you are really ambitious you can make your own. But I fell head over heels for the Thai Sweet Ginger Chili Sauce from Ginger People a while ago, and I’ve never looked back. IT. IS. AMAZING. You also want a bag of frozen vegetable dumplings, which you can find in the freezer section of your supermarket. As you probably guessed. 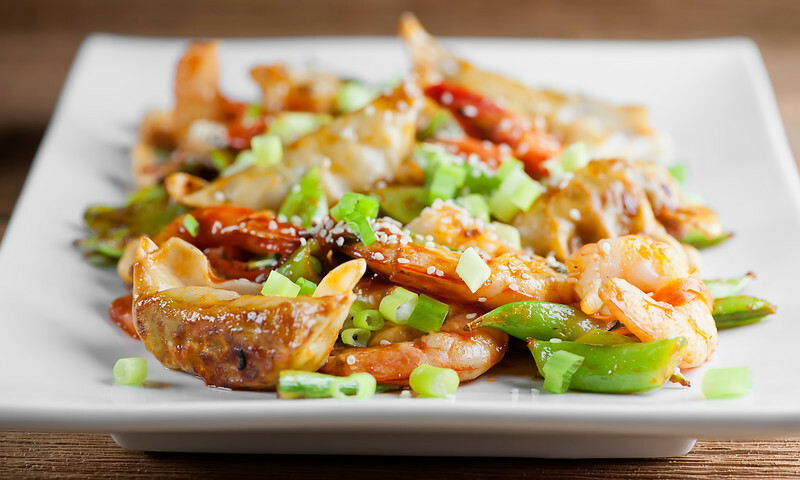 You can also use shrimp or pork dumplings if you want a little more heft to this dish. See? Flexible! You also need about 16 large shrimp, and a pile of veggies. I use sugar snap peas, scallions and carrots, but again – toss what you like in there. I’m thinking peppers, snow peas and broccoli florets would also be fabulous. Once you have all your fixings assembled, you want to cook up the dumplings in a large deep skillet until they are golden brown. Scoop them out and add the veggies, and cook those up until they are tender, and then add them to the bowl with the dumplings. Last but not least, saute your shrimp juuuuuust until they are done (about 2 minutes!) and then add the dumplings and veggies back to the skillet, along with that delectable chili sauce, a little soy sauce and some cashews. Stir everything around gently until the sauce coats it all and everything is nice and warm. You can serve this over rice, and sometimes I do…but sometimes I am perfectly happy having as is, with a sprinkling of sesame seeds on top. You can go toss that take-out menu now. Heat 2 tablespoons of oil in a large deep skillet over medium high. Put the dumplings in a single layer in the skillet, and cooked until golden brown on both sides. Pour in 1/4 cup water and cook until the water is gone. Transfer the dumplings to a large bowl. Add 1 more tablespoon of oil to the skillet and add the peas, scallions and carrots. Cook until just tender, about 5 minutes. Transfer the veggies to the dumpling bowl. Add the remaining oil and cook the shrimp until just done, about 2 minutes. Add the dumplings and veggies back to the skillet, along with the chili sauce, the soy sauce and the cashews. Stir until everything is warm and coated with sauce. Serve with a sprinkling of sesame seeds on top. SO much better than take out! I’ve never had this combo before with shrimp and dumplings, but I bet it is delicious! Extra sesame seeds for me (& maybe some sriracha ;) ). I have never had shrimp dumplings but that needs to be changed because this platter here looks so delicious, Kate. Sesame seeds on top look adorable. Yep! I could always go for dumplings in my stir-fry. Why have I never done that before? Such a great idea! You are making me want this for breakfast! Looks fantastic and easy. Ok, I eat those dumplings quite often Kate and never thought of adding anything to them to make them more of a meal! Duh! Great idea! Your photos are leaving me drooling! !